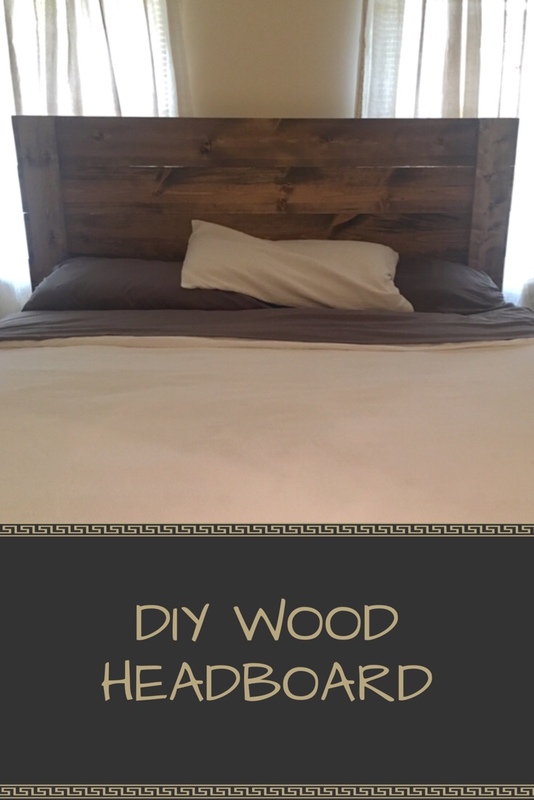 We made this wood headboard for our bedroom. I may have a lot of master bedroom before and afters. We are in operation remodel our bedroom mode. Our bedroom is the only room we haven’t touched since we moved into our house in 2003. Stain – We used Special Walnut and Weathered Oak I bought at Amazon. Measure the width of the frame where the headboard will screw in to. Your headboard width will have to be that wide. For the horizontal boards, we used 1×8. How high do you want it? Take into consideration the height of your mattress and box springs. For support, the 1×6 boards start at the floor and reach the desired height above your bed. You will need one on each side and one in the middle. Determine where you want your 1x8s to start, so you know how many 1x8s you need. These measurements will determine how much material you need. If you are lucky, you can buy the desired length off of the shelf. If needed measure your 1×8 boards and use a square to draw the line for your cuts. Make the cuts using your miter saw. Stain away. We used special walnut and weathered oak. Lay your 1×8 boards together and measure corner to corner to make sure they square. Attach the 1x6s, one at each end. Fasten them to the frame, the boards have to be separated the width of where they will be bolted to the frame. Use wood glue and screws to fasten them. Turn the headboard over and secured the center one. Now you can bolt it to the frame. Ta-da a super cute headboard. You can make a footboard the same way.